There are many times in life where patience is important. I try throughout my week to delay gratification. Waiting for things is a part of life. We wait for Mr. Right, perfect moments, the next paycheck, or the courage to do something new. I do also know that America culturally expects instant gratification. As a culture we do get lost in this. Those who leave America to serve others in third world countries, tend to have culture shock when they return to the ungrateful, instantly gratified, American culture. Yes, I understand this is an issue. On the other hand, we also have a culture that is waiting for the job they hate to become a job they love. They are waiting for their community to be fixed without going outside of their circle and fixing their community as a whole. The job you hate isn’t going to become the job you love. The community that’s broken, isn’t going to become fixed without leaving your comfort zone. I made a super awesome friend, who peacefully took me away from my decaying life. He took me out of my “comfort” zone. He brought somewhere I had only seen on movies. He took me somewhere I hadn’t dreamed of going. He taught me something I had never even thought of being interested in. He took me rock climbing. I had no idea what I was doing. The harness felt weird. There were pro’s climbing. The walls were high. 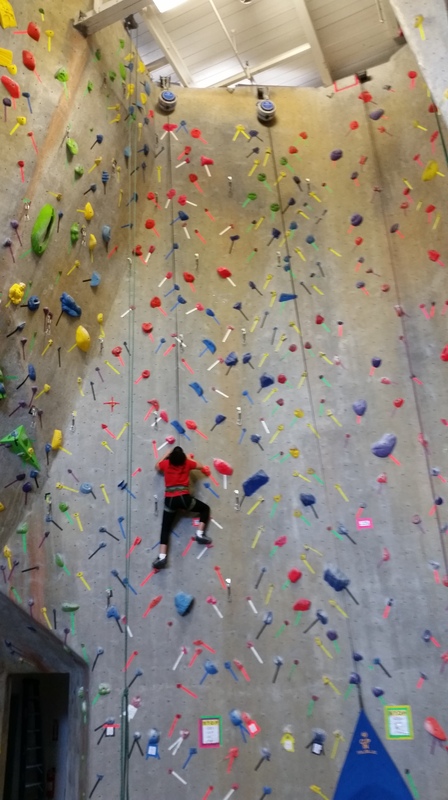 I had to put my full trust into another human, who was belaying me from a dangerous height. I was scared. My life was a wreck. I am not sure anything could go worse than where I was in life. I fought with the wall. I fought with myself. I left the ground, found a new world, and a new me. Someone offered me a challenge, I didn’t have the money and my life needed a lot of work. Some would have told me to stay home and focus on the bills. Some may have said, fix yourself before you try to face other challenges in the world. I stopped thinking at this point. It’s time to get out there! It’s time to fight with your “walls” and yourself! Don’t wait for your life to be perfect. Don’t wait for your boss! Don’t wait for the mayor! Do it! Get out there and make a difference. It only takes one fight, one wall, one helping hand. I may have stopped thinking at this point but I sure as heck started living! Why wait?